Lovett/Codagnone, WEIGHTED, 2010. Performance at the ICA, Philadelphia. Photo: Courtesy the artists. After two weeks of archival research and open rehearsals, Julie Tolentino performs the archive of Lovett/Codagnone’s WEIGHTED. Originally performed at Dixon Place in 2010, this work was selected by Lovett/Codagnone specifically to be archived by Tolentino. 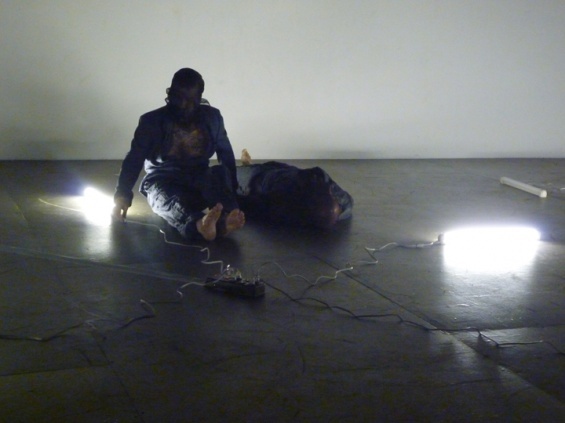 WEIGHTED utilizes minimal and repetitive movements, deliberately referencing dance and theater avant-gardes, and is accompanied by a soundtrack that includes excerpts from The End of Imagination (1998) by Arundhati Roy. The short duet addresses failure as a “feasible, honorable” possibility, and questions the concept of death as the ultimate failure of life. This iteration of Tolentino’s “The Sky Remains the Same” expands the notion of the body of the artist as an archive to include the presence of multiple archiving bodies. Constructed as a duet, WEIGHTED is executed here in its authorized archival form as a four-hour durational repetition of the same score, performed in sequential pairings by John Lovett, Alessandro Codagnone, Julie Tolentino, and Stosh Fila. A talkback with the artists concludes the event.